In June of 1903, Henry Ford incorporated the Ford Motor Company and a month later production of the “Model A” began in FoMoCo’s Mack Avenue plant in Detroit. It had a two cylinder 100 cubic inch engine making 8 HP sourced from the Dodge brothers’ machine shop. 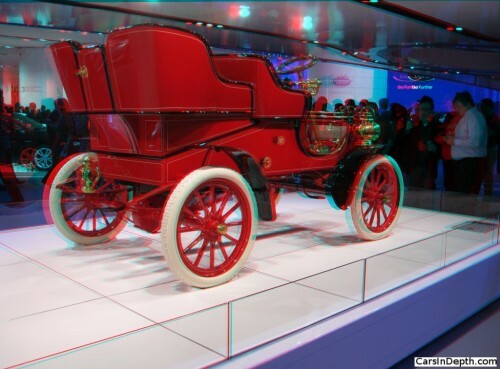 Though Henry would later make FoMoCo into one of the most vertically integrated industrial manufacturers ever, producing even the raw steel and glass that went into their cars, in the early days, like most early automakers, Ford was an assembler. Until they went into business selling cars under their own name, the Dodges were Ford’s primary supplier. This particular 1903 Ford Model A was the third built on the first day of production and it is believed to be the oldest surviving Ford Motor Company vehicle (the Henry Ford Museum is in possession of Ford’s original Quadricycle, which predated FoMoCo by 7 years). Formerly in the noted collection of billionaire trial attorney, the late John O’Quinn, the oldest Ford went on the auction block at RM’s Hershey sale last October and it sold for $288,000 including buyer’s fees. 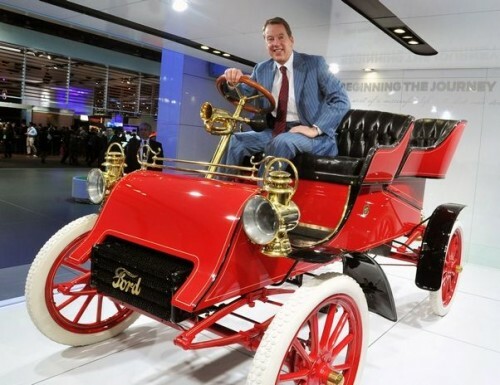 At the time of the sale the buyer was anonymous but in the runup to the 2013 NAIAS as part of the start of the sesquicentennial celebration of Henry Ford’s birth, it was announced that Ford’s great-grandson, FoMoCo chairman William Clay “Billy” Ford Jr. was the buyer and that the car would be part of Ford’s display at the 2013 NAIAS. As a matter of fact, during the media preview, the Ford chairman briefly snuck away from escorting Michigan Gov. Rick Snyder through the Ford exhibit to go check out his new purchase. He hasn’t had a chance to drive it yet – brass age cars require more than just turning the key to start, but he’s vowed to learn how to operate the family and corporate heirloom in time for some of Henry’s 150th birthday events. RM Auction catalog description after the jump. 8 hp, 100 cu. in. two-cylinder engine, two-speed transmission, live axle suspension with full-elliptical leaf springs at the rear, and mechanical brakes. Wheelbase: 72 in. The first Ford Motor Company product was called, not surprisingly, the Model A. It was powered by an opposed two-cylinder engine that displaced 100 cubic inches and was stated to develop eight horsepower. Built on a wheelbase of only 72 inches, it weighed roughly 1,250 pounds, depending upon the body fitted. Its light weight made the most of the engine’s eight horsepower, and importantly, an ordinary man could cover more ground in a day with a Model A Ford than with a horse and buggy. More importantly, the Ford didn’t need to be fed on days it wasn’t being used nor have its stall mucked out! Ford filled his manufacturing pipeline with product in early-1903, making more than a few running changes in the Model A’s design along the way, a pattern that would be repeated many times. Yet, while cash was going out to pay vendors and employees, shipments hadn’t started and income wasn’t coming in to replenish the coffers. In early July of 1903, Ford’s cash balance was just $223.65 and it was doubtful if payroll could be fulfilled long enough to complete the existing works-in-progress. Henry Ford and James Couzens had bet the company on having product ready and customers signed up at exactly the moment the cash ran out. That day was Monday, July 13th, 1903, when the first three orders were received by the Ford Motor Company for Model A Fords. Dr. E. Pfennig sent his full payment, Indiana Automobile Company sent a $300 deposit, and on July 13, 1903, Herbert L. McNary sent a $170 deposit against an $880 order for a Model A with a tonneau body and $30 of options. Those three buyers’ $1,320 kept the Ford Motor Company in business. They were the core of a commercial snowball that began rolling that day. In the next fifteen months, 1,700 Model A Fords would roll out of the Mack Avenue plant. It was the start of the Ford success that would change the history of the automobile and, with it, the history and makeup of our world, more comprehensively and quickly than any single invention before or since. Ford Motor Company, no doubt with Henry Ford and James Couzens physically lending a hand, loaded up those three cars. There was, apparently, no sequence to the numbers of the cars on the Mack Avenue plant floor. Ford’s cars were built in batches in one large assembly room. Parts were attached to the different chassis, and as they were finished in no particular order, the cars were test driven before inevitably being brought in for improvements and fine-tuning. The cars were, therefore, not built in sequential order by chassis number but, for all intents and purposes, together. Based on this construction pattern, The Henry Ford Curator Bob Casey has confirmed that there is no way of knowing precisely which of the three cars was completed first. What is known is that Dr. Pfennig got #11, Indiana Automobile got #9, and Mr. McNary got #30. Of those three, only chassis number 30 has survived, due in part to having only five owners in nearly 11 decades of existence. The details are documented in the original Ford Motor Company ledger, which is still in the possession of The Henry Ford and confirms the receipts of Mr. McNary’s payment. This was also endorsed in a December 28th, 1954 letter from Henry E. Edmunds, Manager of Ford’s Archive Department. While McNary’s Ford is not necessarily the first Model A Ford completed, it is the oldest known existing car sold by the Ford Motor Company and, thus, arguably one of the most important cars in the commercial history of the automobile industry. Without its buyer’s contribution to Ford’s bank account, the Ford Motor Company might very well not have seen August of 1903, except in the hands of receivers. It is no understatement then that Herbert McNary’s surviving 1903 Ford is the basis of the success and survival of the Ford Motor Company. It is of almost unimaginable serendipity that it survives today. Mr. Herbert L. McNary was a butter maker at a creamery in Britt, Iowa. He and his family owned this Ford for about fifty years until, after three years of negotiations, it was acquired by a pioneering auto collector, Harry E. Burd, of Waterloo, Iowa, for the substantial sum of $400. Burd had it restored by Lloyd Sievers. In 1961, Burd sold McNary’s Ford Model A to a Swiss Ford dealer. It remained in Europe, displayed at Ford’s European headquarters in Cologne and in other locations, until the previous owner acquired it in 2001. Since 2007, the car has been in the esteemed collection of the late Mr. John M. O’Quinn, wherein it has been treated to careful storage and maintenance. It is impossible to overstate the importance of chassis number 30. It is accompanied by extensive documentation, detailing its extraordinary history, and its condition is exemplary. It has performed flawlessly on numerous tours, including the world famous London to Brighton Veteran Car Run in 2003, the year of the car’s centenary, and it also received a special invitation to attend Ford UK’s official centenary celebrations that same year. The engine was the subject of a complete, professional rebuild prior to the car’s acquisition in 2007. The Ford also retains all of its original early features, including the extremely rare Kingston carburetor and the original coil box stamped with the car number 30. No automobile manufacturer has had anywhere close to the impact of the Ford Motor Company. Without Herbert L. McNary’s $170 check, modern day motorists might be driving Popes or Flanders or Maxwells, and might speak of Hartford or Tarrytown in the same way they speak of Detroit. Chassis number 30 is one of three Fords sold on the first day the Ford Motor Company recorded orders. It is the only survivor of the three, has had only five owners in the nearly 110 years since it was built, has been carefully maintained and restored, and its history and provenance are impeccable. 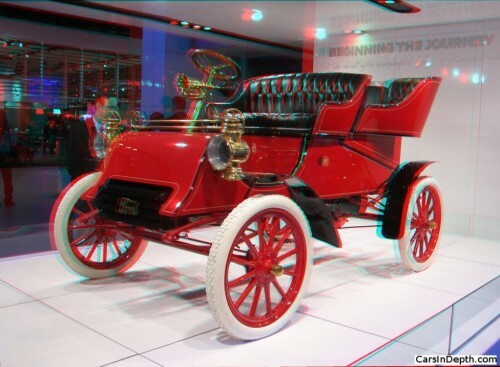 This entry was posted in 3D Imagery, 3D Photos, Automotive History, Car Collecting, Car Shows, Ford and tagged 1903 Ford Model A, Billy Ford, Ford Motor Company, Henry Ford, William Clay Ford Jr.. Bookmark the permalink.